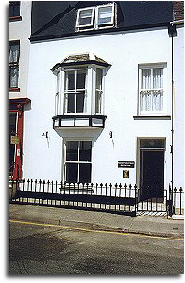 Giltar View is situated in Southcliffe Street, Tenby a few minutes walk from The Esplanade overlooking South Beach, the shops and the walled old Town. The property has also been renovated, furnished and equipped to a high standard. The accommodation is on three floors with a wheel-chair lift from the ground floor to the special bedroom and bathroom. The entrance is ramped and leads to the living room, the kitchen and dining room. The kitchen is equipped with a cooker, fridge and freezer, dish-washer, microwave and food processor. There is also a washing machine and tumble dryer. On the first floor the Special Bedroom has a profiling bed with cot sides and a 3ft single bed, the Special Bathroom is equipped with a Kingcraft rise and fall bath, an adjustable sink and showering facilities. Also available are an electric ceiling track hoist and a range of shower/toiletting chairs. Families needing to use the hoist are asked to bring their own toilet sling. Also on this floor there is a double bedroom and bathroom. There is a further double bedroom and two single bedrooms on the second floor. A high chair is available as are floor sitters, a Jenx table/easel, a Jenx Spider Chair and a Tripp Trapp chair. The maximum number allowed in ‘Giltar View’ is EIGHT, plus a baby, and the Trust reserves the right to cancel the booking if it is exceeded. Incontinence sheets and aids are not supplied. Giltar View has been provided with the support of the National Lottery Charities Board Wales.